On 23rd October 2018 the Bishop of Bristol, Rt Revd Vivienne Faull, was introduced to the House of Lords, and took her seat. Her sponsors were the Archbishop of Canterbury and the Bishop of Salisbury. Vivienne Frances, Lord Bishop of Bristol, was introduced and took the oath, supported by the Archbishop of Canterbury and the Bishop of Salisbury, and signed an undertaking to abide by the Code of Conduct. 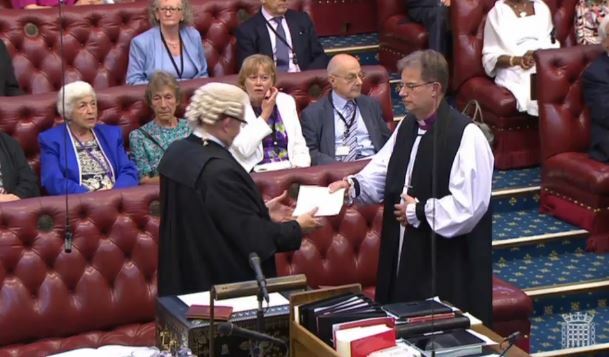 On Thursday 24th May 2018 the Bishop of London, Rt Revd Sarah Mullally, was Introcuced to the House of Lords by the Archbishop of Canterbury and Bishop of Chichester, and took her seat on the Bishops’ Benches. On Monday 15th January 2018 the Bishop of Chichester, Rt Revd Martin Warner, was introduced to the House of Lords and took his seat on the Bishops’ Benches. On Tuesday 21 November 2017 at 2.38 pm the right reverend and right honourable Richard John Carew Chartres, KCVO, lately Bishop of London, was introduced and took the oath, supported by Baroness O’Neill of Bengarve and Lord Luce, and signed an undertaking to abide by the Code of Conduct. Lord Chartres will sit as an independent Crossbench Peer. 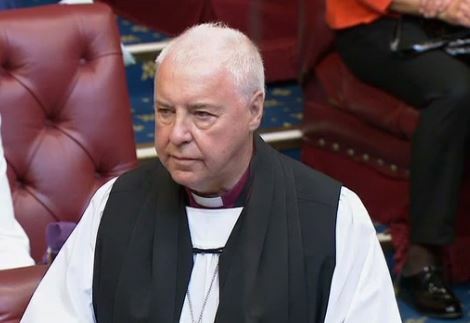 Steven John Lindsey, Lord Bishop of Oxford, was introduced and took the oath, supported by the Bishop of Norwich and the Bishop of Southwark, and signed an undertaking to abide by the Code of Conduct. Pictures of the Introduction are below. A video of the short ceremony can also be watched on the UK Parliament website here. On 26th January 2016 the Rt Revd Christine Hardman, Bishop of Newcastle, was Introduced to the House of Lords and took her seat. Christine Elizabeth, Lord Bishop of Newcastle, was introduced and took the oath, supported by the Archbishop of York and the Bishop of Southwark, and signed an undertaking to abide by the Code of Conduct.